I love gastronomy as the idea of not only consuming food, but also caring about the preparation and the conviviality. Only problem: today my French professor told me that only French and Mexican (Mexican!) gastronomies* have been recognized by UNESCO as ‘world intangible heritages’. Something is wrong with the world today. * La gastronomie est l’ensemble des règles qui définissent l’art de faire bonne chère. C’est a dire, la gastronomie comprend tout ce qui concerne la la préparation des met, la santé‎, et la convivialité.‎‎ Cet art englobe ceux, créatifs dans certains cas, consistant à recueillir, adapter ou inventer des recettes, à sélectionner des produits, à préparer des plats, des mets et à les déguster. Nicklas Bendtner is an average football player who now plays for, or occupies one position in the bench of, Juventus FC. In Italy he first became famous last Summer, because Juventus snatched him from Fiorentina at the last minute, when he was already on a plane for Florence. But here’s another story on Bendtner which is worth telling. Food and colours. Stunning idea by David Schwen. Here and here. Lifesaving social instincts didn’t readily lend themselves to exploration, artistic expression, romance, inventiveness and experimentation — the other human drives that make for a vibrant civilization. To free up those, we needed something that would suppress the rigid social codes that kept our clans safe and alive. We needed something that, on occasion, would let us break free from our biological herd imperative — or at least let us suppress our angst when we did. We needed beer. 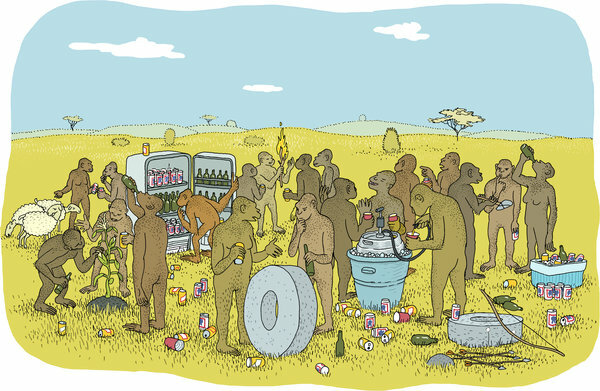 Luckily, from time to time, our ancestors, like other animals, would run across fermented fruit or grain and sample it. How this accidental discovery evolved into the first keg party, of course, is still unknown. But evolve it did, perhaps as early as 10,000 years ago. … Conversations around the campfire, no doubt, took on a new dimension: the painfully shy, their angst suddenly quelled, could now speak their minds. But the alcohol would have had more far-ranging effects, too, reducing the strong herd instincts to maintain a rigid social structure. In time, humans became more expansive in their thinking, as well as more collaborative and creative. A night of modest tippling may have ushered in these feelings of freedom — though, the morning after, instincts to conform and submit would have kicked back in to restore the social order. Read the entire article on The New York Times. Over the weekend I finally got the time to put together and write down some of my recipes on a small paper. This is something I wanted to do for a very long time. Cooking is one of the most enjoyable activities I know. But food is not only a mere pleasure. When in Bruxelles with Mita I saw a poster that said People eating alone die earlier. Every recipe I now have on my paper reminds me of some special persons and some special places: crepes, Stefania in Santa Cruz; pasta Sangiovese, Marco and Giulia in Dublin; pasta alla vodka, Saverio and the rest of the crew in Valencia; Salmorejo, Martin and Anna in Granada; tortilla, Pablo in Salamanca; cheeseburger, Evan and Neel in Tofino; pancakes, Thomas in Victoria; pasta amatriciana, Aaron in Victoria; fried banana, Iris and the rest of the crew in Fanø. When I am abroad, food’s taste becomes much more important than usually. As a matter of fact, I always find a great recognition of the specificity and the quality of Italian cuisine. It is interesting to see how much foreigners are passionate and envious – in a good way – of Italian dishes. At the same time, it is surprising to see how greatly Italian cousine is misunderstood. This article is the best I could find on the most common mistakes that are made, especially in North America about Italian cuisine.